the casemate on the first floor. Historians have learned much about Confederate Navy life from other artifacts salvaged from the CSS Neuse. Museum visitors can see coal rakes used to keep the coal evenly burning in the boat’s huge boilers, cannonballs, ammunition shells, a belt buckle, wrenches, files, shovels, sockets, the cook’s stove, the bell from the CSS Neuse and an intact bottle of Lea and Perrin’s Worcestershire sauce. A rare English-made cuff button from an officer’s coat, a button bearing the N.C. state seal and another with the Confederate Navy emblem are among the treasures on display. A wall plaque offers information on some of the boat’s crew members, including Capt. Joseph Price and 2nd Lt. Richard Bacot. Also on the wall are photos showing the rescue operation undertaken to bring the CSS Neuse up from its watery grave in the Neuse River. 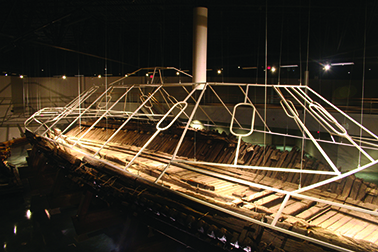 A cut-out scale model of the boat gives visitors a birds-eye view of life aboard a Civil War gunboat, and a video presents a history of the boat. The story of Richard Caswell’s life is memorialized in a museum at the state site bearing his name. 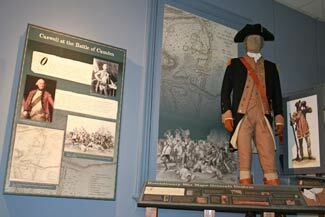 Caswell was a Revolutionary War hero, North Carolina’s first elected governor and a prominent businessman. He was a delegate to the Second Continental Congress, and only ill health prevented him from becoming a signer of the Declaration of Independence and the U.S. Constitution. Visit the world’s only full-sized facsimile of a Confederate gunboat to realize what a sailor’s life was like during the Civil War. The project was under the direction of master shipbuilder Alton Stapleford. The 158-foot long boat draws visitors from across the United States and from foreign countries. 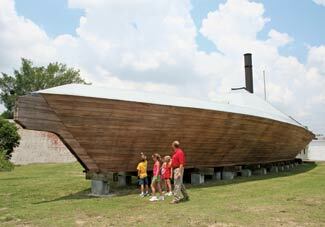 If you’re fortunate, you may visit the Neuse II while teens train as Confederate naval cadets. The boat rests a scant distance from the “cat hole” in the Neuse River where the original ironclad gunboat was fitted with iron plating. 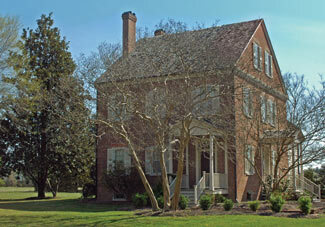 The Stroud House, home to the Caswell Center Museum, built in the late 1800s once was the main house of a plantation. In 1911, thanks to Dr. Ira Hardy, it opened as the state’s first residential facility for mental retardation patients. Touring the museum gives visitors a glimpse into treatment methods used nearly a century ago. 10am – 5pm, Saturdays. Other times by appointment. Almost every man, at some time in his youth, yearned to be a fireman, riding on the back of a red fire truck and ringing the bell to tell everyone within hearing distance that help was on the way. 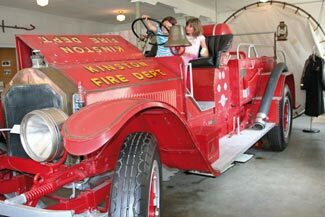 See some of the late 19th century’s fire equipment, including a truck that was on the scene during Kinston’s devastating fire of 1895 that destroyed nearly all downtown homes and businesses. The building, on the National Register of Historic Places, is the city’s original fire station and the oldest brick structure in Kinston. In the twilight of a December night, the sounds you hear might be a breeze tickling the grass, or the long lost voices of Confederate and Union soldiers fighting to the death. The bloody First Battle of Kinston began on Dec. 10, 1862 and left 685 casualties after 2,400 Confederates faced 12,000 Union troops. Now you can walk this hallowed ground. A plaza on the battlefield displays the U.S. flag flanked on either side by the Confederate and Union flags flown at the time of the battle. A walking path tops a berm, and along the side are markers for each state whose soldiers fought in the battle, along with the state’s regiments. The battlefield is part of the North Carolina Civil War Trails program, which helps provide historical markers to interpret campaign sites and corridors of the Civil War. A self-guided driving tour brochure for the First Battle of Kinston is available at the Kinston-Lenoir County Visitor and Information Center. Private battlefield tours available by appointment only. Contact 252‑522‑0540. An old church on the battlefield where the heat of the battle took place. Harriet’s Chapel was used as a defensive position before the battle and a hospital after the battle. As you stand on the site of Harriet’s Chapel, step back in time and imagine the horrendous scene in this area following that bloody battle on the morning of December 14. The church, an old barn like structure was perforated with bullet and cannon ball holes, bodies lay scattered on the ground and on the floor, as surgeons began treating the wounded and using the battle scarred building as a hospital. Starr’s Battery Site – Captain Joseph Starr at this position commanded a crew operating for six cannons surrounded by still existing earthworks. The Second Battle of Kinston, often called the Battle of Wyse Fork, was fought March 7-10, 1865, near Southwest Creek. Confederate forces numbered 8,500 against 12,000 Union troops as the federal army advanced from New Bern toward Goldsboro. Their goal was to secure the New Bern-Goldsboro Railroad so it could supply Gen. William T. Sherman’s army. The battle left 1,500 Confederates and 1,001 Union casualties. Self guided driving tour brochure and CD for the Battle of Wyse Fork are available at the Kinston-Lenoir County Visitor and Information Center. Art lovers won’t want to miss a stop at the building now housing one of the finest arts centers in the state. 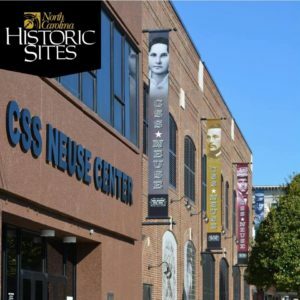 The state-of-the-art 30,000-square-foot center is today on the National Register of Historic Places. Visual art occupies one-third of the space, with exhibits changing every six to eight weeks. 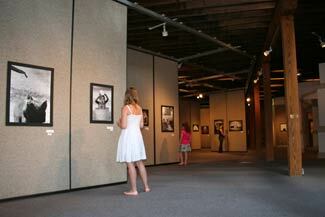 As many as 300 works by up to 200 local, regional, national and international artists are on display at any given time. A large, detailed model train display is part of the permanent exhibit, and runs from 10 a.m.-2 p.m. every first and fourth Saturday of the month. Located on the Trent River, just 29 miles from Kinston, the Foscue Plantation welcomes you to a period in time more than 200 years ago. Built in 1824 by Simon Foscue, Jr., the plantation house has been in the family for eight generations. 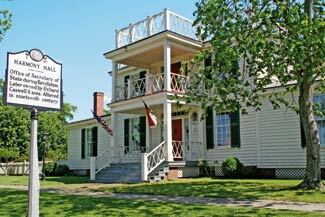 The décor is high-style antebellum and retains a number of original furnishings. In addition, the family has continued to acquire antiques which are correct to the period. If you want to step back in time and find out about a fascinating tale of love and war and the strength of a Southern family, you have come to the right place! Placed on the National Register of Historical Places in 1971, it was one of the first in North Carolina to be so designated. It is definitely a tour you won’t want to miss. With three floors and a working basement, cemetery, garden, forest, plantation land, and the Trent River at the back of the property, there is certainly much to see. Walk through history of this nation’s conflicts and those who served our country. Listed in the National Historic Register, the Grainger-Hill Performing Arts Center in Kinston, North Carolina is one of the last remaining examples of Greek Classical Revival Architecture still standing in North Carolina. Visitors should call 252-522-0421. Harmony Hall is operated by volunteers. It is a goal of the Lenoir County Historical Association to increase volunteer Docents in the future in order to serve to public better. Jesse Cobb built this colonial showplace in 1772, four years before the American colonies’ war for independence. Richard Caswell, Revolutionary War hero and North Carolina’s first elected governor, once owned the house and for a brief time it became the state’s capital, housing important records and accounts. Listed on the National Register of Historic Places, Harmony Hall is lovingly restored and furnished with meticulous attention to detail. Many original features, such as brickwork and moldings, are examples of work by early Kinston craftsmen. A garden features flowers and plants indigenous to the area and appropriate to the age of the house. A turn of the century schoolhouse sits at the rear of the property, complete with desks and blackboards. You won’t find a better collection of historical information about eastern North Carolina, Virginia and South Carolina than at Heritage Place. Walking into the room is like taking a step back in time. Pick up a family tree packet and trace your roots. 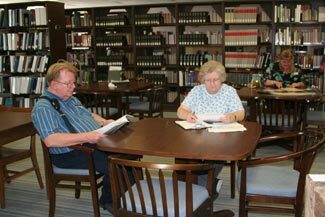 Read priceless family notes and records donated to the center, as well as wills, deeds and vital statistics. You can even study U.S. Census reports from 1790 to 1930, or local newspaper records from 1855 through current issues. Online help from Ancestery.com and HeritageQuest is available. 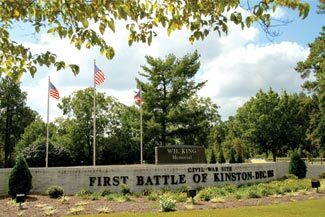 The Kinston-Lenoir County Visitor’s and Information Center is located on the historic battlefield of the First Battle of Kinston. Indoor and outdoor displays are representative of the 1862 First Battle of Kinston and the Civil War. Restroom facilities, pet facilities, vending area, wireless internet and local, regional and national maps are available. A 30 sq. ft. fiber optic map of Lenoir County and the surrounding area interprets the North Carolina Blue-Gray Scenic Byway, through the Lenoir County area, and the First Battle of Kinston. A 50 seat auditorium with films showcasing Lenoir County and its current attractions and the Blue-Gray Scenic Byway run until 5:00 p.m. 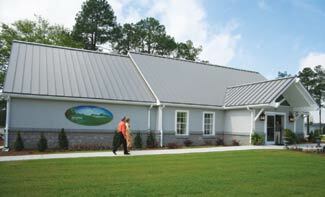 The Kinston-Lenoir County Visitor’s Center serves as a stop on Amtrak’s bus service in eastern NC. For more information, visit Amtrak’s website. Housed in the historic Commodore Barrow House, built circa 1905, the La Grange Arts Center serves as a cultural center hosting exhibits, craft shows, and art classes. The center, the first brick home in La Grange, today includes exhibit areas, a studio for classes, a clay room and kiln. There is also an updated kitchen for catered affairs. Visitors may also enjoy architectural details original to the home including a beautifully “grained” staircase and hall woodwork as well as a Eastlake frieze dividing the front and back hall. The city’s oldest municipally-owned cemetery is a 21-acre treasure of unique monuments on graves dating back more than a century and a half. Many members of Kinston’s leading families are buried here, and some tombstones date back to the 1840s. One area contains a large mass grave of Confederate soldiers who died during the Battle of Kinston in 1862. The United Daughters of the Confederacy erected the original monument 30 years later. 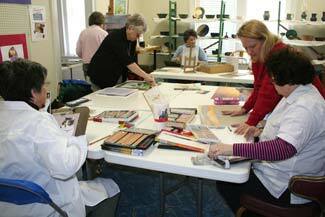 A fine arts and crafts gallery displaying and selling North Carolina art of varied medias, styles, and price ranges with studio artists on site. Credit and debit cards accepted. The Walk of Honor is a permanent commemorative walkway that is paved with bricks engraved with the names of honored men and women who have served our great country. It parallels the picturesque Neuse River as it winds its way through the beautifully landscaped Tiffany West and Neuseway Veteran’s Park. Along the way small sitting areas and memorials will afford quiet places for reflection and tribute. We are proud to be 1 of 10 communities selected by the National Civic League as an All-America City in 2009.